I love fried food and always crave for my fish and chips. Because of this, I own a deep fryer at home for my disposal whenever I need it. If you are like me, you probably looking for a deep fryer for home too. So, if you haven’t decided which deep fryer to get, this quick deep fryers review and guides post is just what you needed to help you to hunt for the best fryer for home use. How to Pick The Best Fryer For Home? Many home cooks look for different ways to make restaurant-styled food at home. However, if you check the restaurant menu, a majority of tastiest foods fall into the familiar category of fried food. So if you love these fried foods and cannot keep your hands off them, here are some of the best deep fryers reviews that will help make the choice easier. But before we look at the top three deep fryer picks, here are few things that you must consider while shopping for your deep fryer. When you start searching, you may come across three main types of fryers available in the market. These are the most common option available in the market. Electric deep fryers are safe to use indoors, but many people believe that they do not give the best results. They are available in a variety of sizes, so you can choose one depending on your requirements. 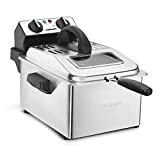 If you are going to stick with frying small foods, it is always better to get your hands on the more affordable electric fryers falling in the $40 to $60 range. One of the most popular categories of deep fryers is the propane deep fryers. Food friend in propane deep fryer is crispier and tastier than the food fried in the electric deep fryer. However, these fryers occupy bigger space, thus you need to be cook at outdoor. Moreover, picking up a propane deep fryer increases your work as you need to store, refill and move the propane tank, whenever required. Air fryer offers a great alternative to all those who wish to enjoy the same taste of fried food without actually frying the food. It is not actually a deep fryer, but is oil-less fryer that uses air to produce crisper food on the outside and juicy on the inside. This is a healthier and safer alternative for all those people who love eating fried food minus the oil. It must be remembered here that air fryers cost more than the traditional deep fryers. You need to determine food amount you will be frying for in the deep fryer. If you are frying food for one or two people, you can get your hands on a fryer that comes with 1000 to 1500 watts of power. But, if you have a large family who enjoys eating fried food a lot, buying a fryer with 3.5 liters food capacity and 1750 watts of power would be sufficient. Deep fryers for home use generally come with an adjustable thermostat which allows monitoring of the temperature. Always pick a deep fryer with adjustable temperature setting as it comes handy while cooking a different kind of foods. Every food item cannot be cooked at the same temperature thus controlled temperature settings are necessary. When you are frying a lot of food, you need to take care to avoid any burn or splashes. You should pick up a deep fryer that comes with a food basket equipped with cool grip handle. Some models have a basket that can be lowered in the oil while others have rotating baskets. So make sure you choose one according to your requirements. Another important feature that will help you while frying food in an electric deep fryer is the timer. It allows an individual to set a cooking time so that he can just and relax while the fryer does the work. A timer also makes sure that the food is cooked to perfection. One of the biggest cons of frying food is the nasty lingering smell of oil that is left behind. However, there are some models available in the market that not only filters away the excess oil; rather it absorbs the smell of oil. Many deep fryers also come with easy clean oil drain system which makes cleaning easier. However, you need to be careful with the amount of oil used as some models may leak, if they are overfilled with oil. The safety feature is important when picking up the best deep fryer. Look for a model that comes with a securely locking lid, breakaway cords, indicator light and more. Some models also have skid-free feet that make it easy to keep the fryer securely on the table top. To achieve great results, it is important to pick the right oil. You will need oil with a high smoking point as it will heat up quickly and fry the batter without penetrating into the food. The correct temperature will help you create the light, crispy deep fried food, so make sure to use an oil thermometer. Large number recipes specify the desired temperature and having an oil thermometer nearby will make things easier. Traditionally people choose to drain their food on a paper towel or paper bags. However, a more reliable method is to use a cooling rack. Some deep fryers come with separate racks that need to be dipped in oil to deep fry the food and these separate racks make it easy to drain the oil as well. Here are the top 3 deep fryers that I love the most. If you are looking for a large capacity deep fryer for home, then this is the best bet. The Cuisinart CDF-200 deep fryer has enough room to easily cook over 2 pounds of food. It can be used to fry a variety of food, including chicken, doughnuts, potatoes, vegetables, and onion rings. The T-fal FR8000 Deep Fryer works on 1700 watts power and has 3.5 liters capacity. It comes loaded with amazing features that make it one of the best deep fryer for home. One of the highlights of this deep fryer is the immersion type heating element that quickly heats the oil and keeps it at an even temperature. It also has an automatic oil drainage system that drains excess oil away from your food. If you are in love with fried turkey, you need to own this 20lbs deep fryer by Masterbuild. The fryer has a cooking power at 1650 watts that can heat up cooking oil easily. It also has an analog controls and digital timer so you can set the time you wanted and a thermostat temperature control to prevent overheat too. Cleaning is easy with this new Masterbuild Butterball model. There is a oil drain valve for you to conveniently drain out the oil after using the deep fryer. Also, this model is designed and tested to meet commercial standards. So you can use it for business too. Out of the all, I would recommend the Masterbuild as it is easy to use and can be used to fry, boil and steam food for a large number of people. The Masterbuild butterball has one of the best net customer satisfaction too. So get your hand on the best fryer for home and start making some delicious recipes. Also, never forget to clean and maintain your fryer regularly. Our friend at Two Kitchen Junkies has written a complete guide on how to ﻿﻿clean a deep fryer. Do check it out.